Interested in adding 3D printing and other makerspace tools to your courses, but not sure how? 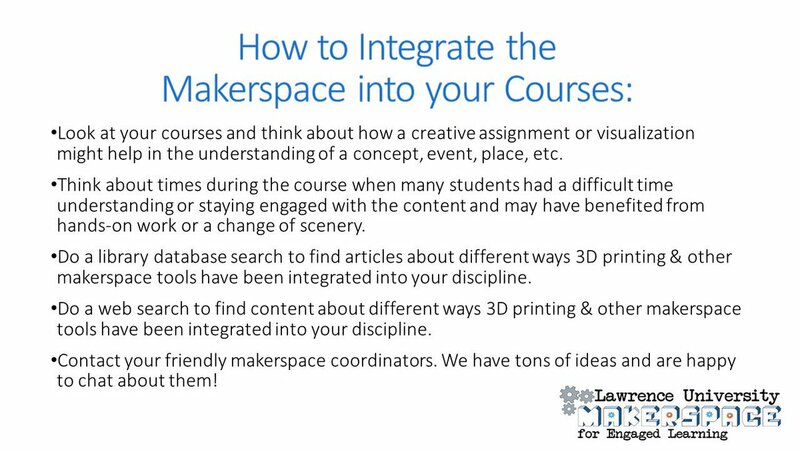 Below is a presentation delivered to Lawrence University faculty about some of the whys and hows of using the LU makerspace with coursework. What is a makerspace and what’s in our makerspace? Where to find this stuff? Makerspace Assignment Request Form: By letting us know about the intended learning outcomes and equipment they’d like to use, we can do some research and set up a time to meet to discuss assignment ideas. Faculty 3D Printing Request Form: We’re happy to print objects that faculty may need for their teaching or scholarly/creative work. While faculty are welcome to come over and do their own printing, we know that sometimes this isn’t possible. One slide from the presentation. Image links to the Google Slide of the full presentation. This entry was posted in Assignments on April 4, 2019 by Angela Vanden Elzen. There have been lots of exciting new projects and class assignments happening with VR (virtual reality) at Lawrence University! Take a look at the recent Lawrence University News post, “Use of VR tech now reality in classrooms; FaCE grant to ramp up pace” to learn all about them! This entry was posted in AR/VR Technology, Assignments on March 5, 2019 by Angela Vanden Elzen. Just like how humans have various senses, self-driving cars use various sensors as well. Roughly speaking, they have six types of sensors: radars, lidars, cameras, IMUs, GPS, and ultrasonic sensors. They differ in range, cost, and many other things, but I will try to cover the basics in this article. Before we learn anything about sensors, it’s good to be able to categorize them. For instance, you can categorize sensors as being passive or active, meaning if they actively send out signals or just passively receive what’s in the environment. You can also categorize them by the type of signals they work with; cameras and lidars work with light, while ultrasonic sensors work with sound and radars with radio waves. In addition, it’s also good to have some physics knowledge, so you can know more about the pros and cons for each sensor. Let’s talk about the simplest sensor first: ultrasonic sensors. As the name implies, they emit and receive ultrasound to estimate distance. It’s called ultrasound, because its frequency is over 20,000 HZ, the upper limit of the sound frequency that humans can hear. As a result, the sensor wouldn’t be constantly making noise, because we can’t hear it! Another good thing about ultrasound is that it has less diffraction, which I won’t get into. If you want to learn more about sound, take PHYS 107: Physics of Music! The more complex sensor is the cameras, although it’s more common. Essentially, it uses photosensitive devices to capture light. I won’t get into the physics of such devices, because it’s just too complex. However, I will say that as a sensor, cameras give us a lot of information. A lot of information is not necessary always good, because sometimes we don’t just know how to make sense of it. Computer vision is a type of area where people are trying to make sense of such information, and to them, I say good luck! For the rest of the sensors, I will just briefly mention them, because I either don’t know much about them or they are hard to write about. We have radars which have been used in the automotive industry for a long time. They are cheaper than lidars, but don’t give you as much detailed information. Then there’s the IMU, which stands for Inertial Measurement Unit. It uses accelerometers and gyroscopes, and sometimes magnetometers. Last but not least, we have all used GPS, as it’s embedded in most of the phones. Here you have it, the six different sensors used in self-driving cars. Beware that each sensor is a sophisticated piece of technology beyond the scope of this article. Just to illustrate how sophisticated each sensor can get: rockets need some very precise IMU to go to space, and some self-driving car companies use the same type of IMU! How incredible! This entry was posted in Alumni/Guest Post, Computer Science and tagged self-driving car on February 15, 2019 by Wenchao Liu.